We love our Nobel. He is the perfect stud dog. He has a great solid gene pool. His health and his wellbeing are of our prime concern and guarantee that you will get the best he has to give. Nobel was born on 16 August 2013 in Kirov, Russia. We travelled all the way to Kirov to get him after seeing his handsome father and beautiful mother. He was a gorgeous puppy. As you can see from his Russian Pedigree, his bloodline has champions on both sides. 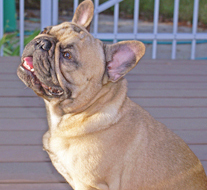 When you look at his and his father’s confirmation, you can see that he is the epitome of what a French bulldog should look like as defined by the American French Bulldog Club of America of which we are members. Nobel has a sweet disposition and is quite lovable. Please have a look at the video below, you can see that he trains well and we have entered him in local dog show competitions. He has become a Champion of which we are so proud. Nobel is a fawn color as are both his parents. When it comes to the care of Nobel we spare no expense. 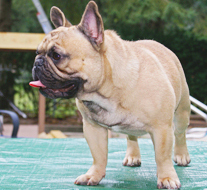 As you can imagine he is AKC & AKC DNA registered. He has all his latest shots and medicines to date. We have taken the time and great care to have him OFA (Orthopedic Foundation for Animals) tested Nobel. Nobel has been tested for Degenerative Myelopathy and found to be “Clear” or “Normal”; meaning he does not have either the ‘X’ or ‘Y’ chromosome contributing to the disease and for that reason cannot pass it on to his offspring. These things mentioned will minimize diseases and help to bring a good strong bloodline to your door.